Clinton B. Little, Electrician's Mate 1/c, born Aprin 17, 1921, Seattle, WA. 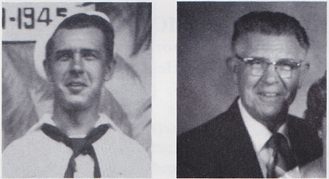 He enlisted in the USNR in 1938 at grade of V-1; advanced to O-1; and cruised in the USS Oklahoma the summer of 1939. They dropped hook in San Francisco for the World's Fair at Treasure Island. He enlisted in the USN Feb. 12, 1940; took boot camp in San Diego; went aboard the USS Bridge (FFT); then to the USS West VIrginia (BB-48) at Pearl Harbor. Made shell back on July 24, 1940, near Christmas Island; rode her to the bottom of Pearl Harbor, on Dec. 7, 1941, as EM3/c, general quarter station, torpedo air compressor room starboard, below anchor windlass. Made it to the beach in good shape and was assigned to the USS Lamson (DD-367). He eventually joined the Anzac Sqdn. in the South Pacific with the USS Perkins (DD-377); USS Chicago, HAMS Australia, HMNZS Achilles and HMNZS Leander; and Mare Island in July; Tassafaronga, Guadalcanal, Nov. 30, 1942. At sea they lost the USS North Hampton, with heavy damage to the cruisers USS Minneapolis, USS New Orleans and USS Pensacola. All destroyers were safe and out took Honolulu hell bent for Espiritu Santo. In July 1943 he was assigned new construction in Seattle aboard the USS Sutterlee (DD-626) with Henry Fonda QM3/c. Made two atlantic crossings then was assigned to V-12 College Program at Iowa State College, Ames, IA. Went back to sea in May 1945, aboard USS Otterstetter (DE-244) as EM1/c at Pearl Harbor, August 13 and 14 when the Japanese surrender. Proceeded to the West Pacific, Iwo Jima and the Bonin Islands. His hitch was up Feb. 12, 1946. He returned from Okinawa aboard USS Tobberer (DE) and was discharged at Shoemaker, CA. Joined the USNR Submarine Reserve at USN Armory, Lake Union, Seattle, WA, in 1948 for four years plus nine months for the Korean War as EM1/c. Operated Little's Auto Service and Supply for 39 years and retired in 1984.